Can the Year of Mercy help overcome the indifference of the international community to the violence and political turmoil in Burundi? Burundi is bleeding. Yet it seems no one is paying attention, while those with the capacity to help restore peace are occupied with other priorities; especially Burundi’s neighbors, Tanzania, Rwanda, and the Democratic Republic of Congo. Last weekend, the country experienced one of the worst episodes of violence since the current political crisis broke out in April after the president, Pierre Nkurunziza, announced his intention to seek a third term in office. In May, a constitutional court ruled in the president’s favor, prompting an unsuccessful coup attempt by some army officers. The elections still went on in July, with Nkurunziza being declared winner. He then went on to strengthen his grip on authority with brutal security operations, which, according to the government, were meant to flush out the coup plotters. In the meantime, clashes were reported on an almost daily basis, with senior military officials, journalists, opposition figures, and ordinary citizens being targeted. Last Friday, the military reported that 79 “enemies” and eight soldiers had been killed when attacks were launched on military bases in the capital Bujumbura. In Nyakabiga, a suburb of Bujumbura, more than 21 people were reportedly shot by security forces. A military spokesperson, Clement Cimana, denied the allegations, saying that “we never killed civilians,” while claiming that the attackers retreated into the Nyakabiga suburbs to get reinforcements and were pursued by the military. 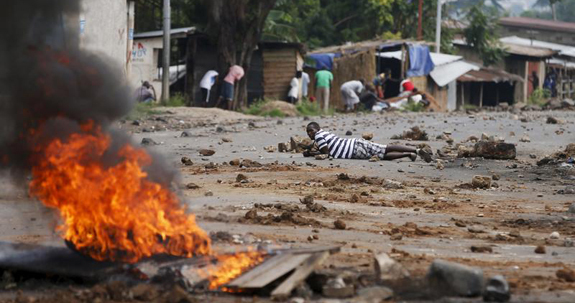 In the meantime, the United Nations has held numerous briefings on the situation in Burundi. On November 12, the UN adopted Resolution Number 2148, which called for “additional measures” on all actors “whose actions and statements contribute to the perpetuation of violence and impede the search for a peaceful solution.” The United States and the European Union have both imposed sanctions on individuals it considers threats to peace and stability, and who are engaged in human rights. While it might seem that these efforts indicate a genuine effort to resolve the situation, the reality in the country shows that it is too little, too late. But it is the apparent lack of urgency from Burundi’s neighbors and the East African Community, the regional bloc to which Burundi has membership, that is quite baffling. 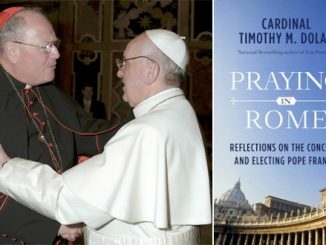 In Kenya, just weeks after the visit of Pope Francis, a high-level meeting of the World Trade Organization is taking place in Nairobi, while the leaders in Uganda, another East African nation that hosted the Holy Father, are busy campaigning and gearing up for presidential elections due next year. Tanzanian leadership is also just settling down after a hotly contested poll in late October. President Kagame of Rwanda perhaps stands out as the only African leader who has spoken strongly against the violence across his border. The two countries share more than just a border. They have a common history and culture. And so it would seem, Burundians have been left to their own devices, with little if any, international media coverage of events unfolding there. Pope Francis proceeds to show the connection between the three levels of indifference, and how peace is threatened by globalized indifference. “Indifference towards God transcends the purely private sphere of the individual and affects the public and social sphere. On both the individual and communitarian levels, indifference to one’s neighbor, born of indifference to God, finds expression in disinterest and a lack of engagement, which only help to prolong situations of injustice and grave social imbalance.” The social imbalance in Burundi is quite glaring, as inequalities between the capital Bujumbura and the rest of the country are high. Poverty levels are crushing, despite the fact that natural resources abound. Last week, the United Nations Development Program (UNDP) released its 2015 Human Development Index, ranking Burundi at 180 out of 187 countries. The Human Development Index is a tool employed in comparative measurement of economic policies on quality of life, with indicators such as life expectancy and education. comforting the suffering population while sending a message of courage to religious and sacerdotal communities and educational institutions in parishes, with pastoral messages being sent out to both the political class and the Christian communities advocating for peace. In May this year, after President Nkurunziza had announced he was running for a third term, the Bishops’ Conference issued two pastoral letters, stating that “the truth is clear. The president elected by the people of Burundi must not exceed the two terms of five years stated in the constitution.” Archbishop Ngoyagoye himself has been the target of an assassination attempt which was halted in its final stages, painting a picture of a climate of fear and intimidation. Can the “Year of Mercy” help overcome the indifference and hence win peace for Burundi? “Jesus taught us to be merciful like our heavenly Father,” says Pope Francis in his message of World Day of Peace, adding that Jesus “condemned those who fail to help others in need, those who ‘pass by on the other side,’” and that by this example, “he taught his listeners, and his disciples in particular, to stop and to help alleviate the sufferings of this world and the pain of our brothers and sisters.” In concluding his message, Pope Francis, as a sign of peace in the Jubilee of Mercy, makes a three-fold appeal to the leaders of nations: to refrain from drawing other peoples into conflicts or wars, which destroy—in the long term—their moral and spiritual integrity; to forgive and manage in a sustainable way the international debt of the poorer nations; and to adopt policies of cooperation which will respect values of local populations, as opposed to bowing to the dictatorship of certain ideologies. These three elements can certainly win peace for Burundi, if leaders within and outside the country heed the appeal made by Pope Francis and make it their own, for the Jubilee of Mercy and beyond.